Miele against Samsung is an interesting comparison. On one hand, you have the premium Miele with a pedigree in dishwashers. On the other hand, you have the technology forward Samsung. Along with laundry and especially refrigeration, they are looking to redefine the appliance industry. First, we will look at both companies, both products, and then compare. 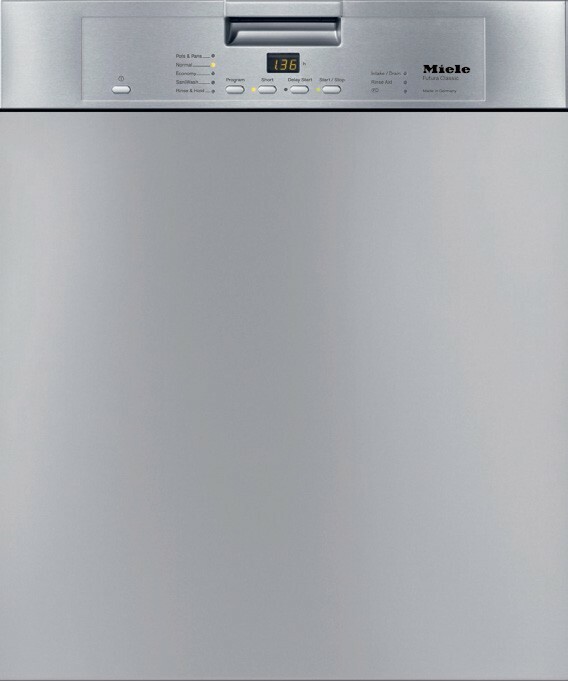 Miele is the largest family-owned appliance manufacturer in Germany since 1889. Their motto is "Immer Besser" or Forever Better - a design and manufacturing philosophy and vision. 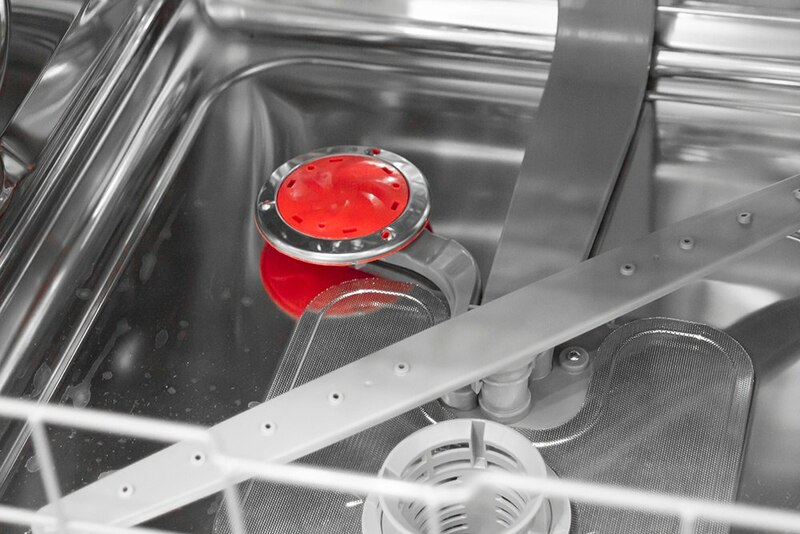 Miele manufactures 96% of the parts creating the dishwasher while the additional 4% is manufactured in the factory's surrounding area. More significantly, they test every dishwasher before it leaves the plant. Their quality control and reliability are outstanding. Samsung started in Taegu, Korea in 1938. Samsung means "three stars" in Korean. In 1975, Samsung-Sanyo Electronics merged into Samsung Electronics. Today, Samsung controls the electronics marketplace. Everywhere you turn a cell phone or a television tablet, for example, most likely is made by Samsung. Samsung's competitors include Apple, Sony, and LG. Samsung has become a major player in the home appliance market. In appliance store showrooms you are seeing larger displays of Samsung's dishwashers, refrigerators, wall ovens, and cooktops. 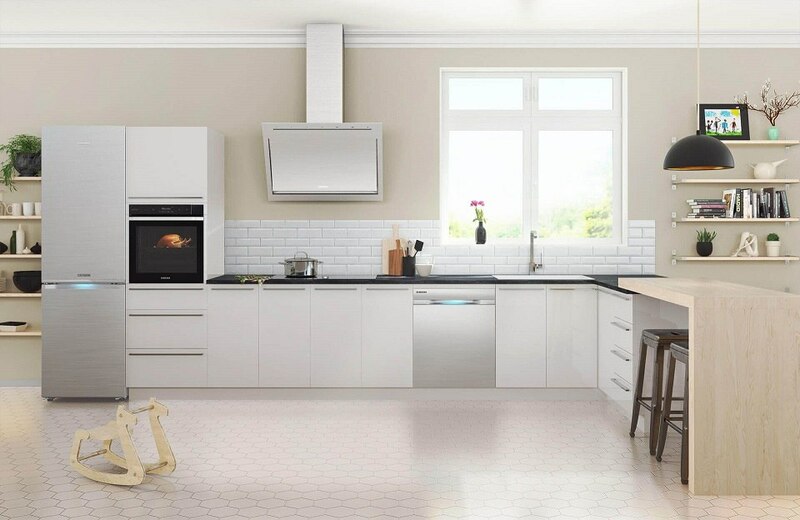 Their appliances feature the newest technology geared towards a younger generation of homeowners. Third upper rack for silverware only. 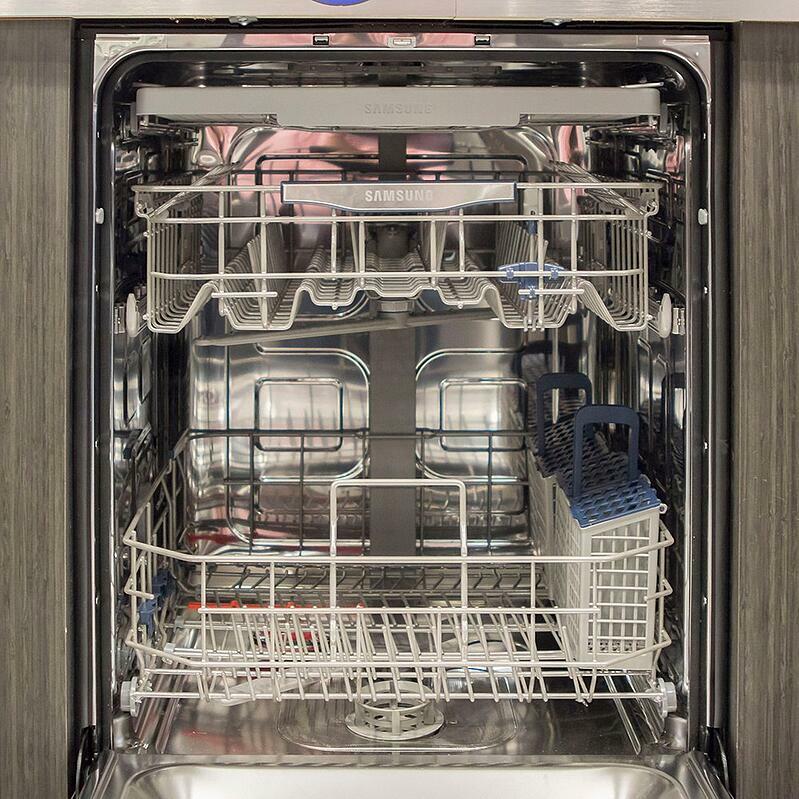 Samsung has redesigned their dishwashers by imitating the best features of others while innovating other features. Their Express 60 is a knockoff of the Bosch Express wash with its ability to quickly wash and dry a load of lightly soiled dishes. 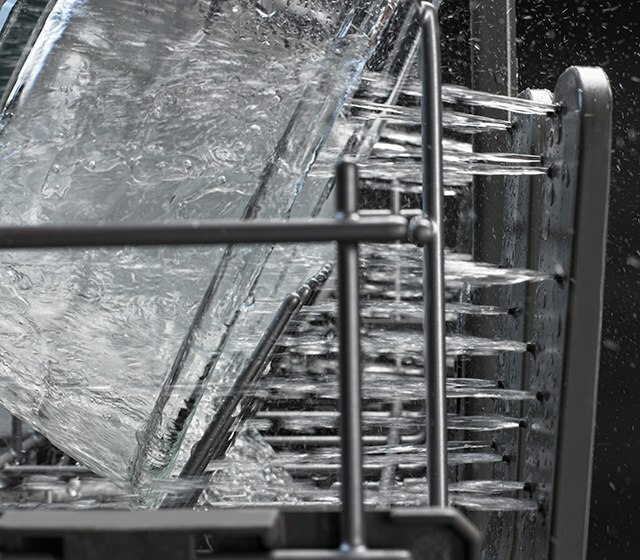 The auto opening door incorporates Miele's own drying system of automatically opening the door after the cycle to speed the drying process. It also has the third rack for silverware, another popular Miele feature as well as automatic load sensing and digital leak detection. Samsung adds the "StormWash" or a concentrated wash for baked on dishes. It is very similar to the KitchenAid ProScrub. 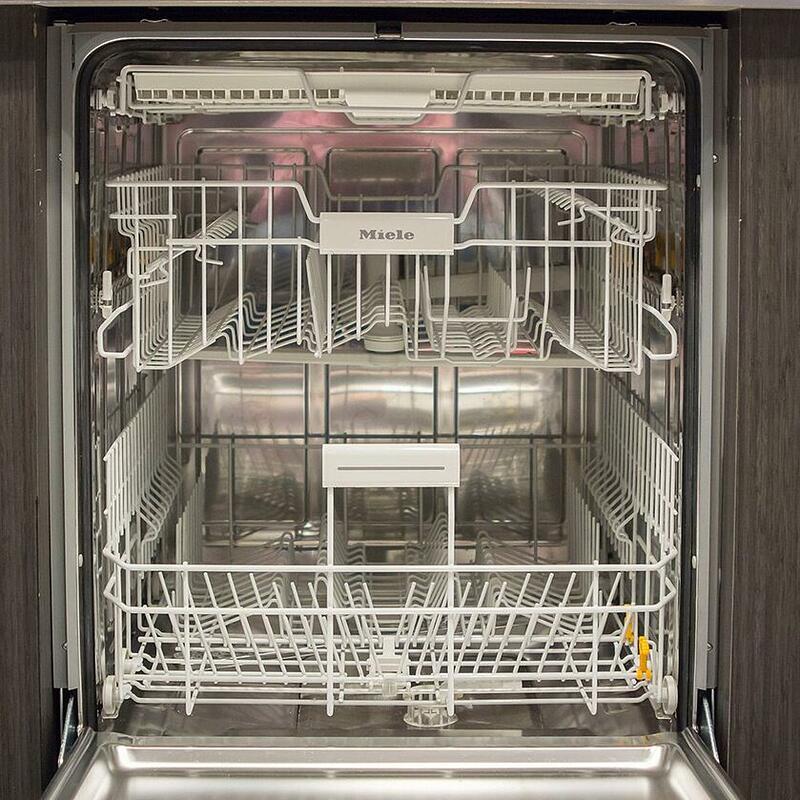 With Miele, their Clean Air-drying system allows air to be infiltrated to the side of the dishwasher. The hot air is attracted to the cooler side and is dissipated as water. The basic Miele does not have the cycles of the Samsung but has the better rack adjustability. It is also a solid machine with a double insulating pump to prevent leaks. Samsung is a great choice for a multitude of cycles and features. The price is affordable (buy it on holidays for even lower prices). However, do you need new technology in a dishwasher? You need the dishes clean. You also want the dishwasher quiet because many kitchens are open to living spaces. However, the undercurrent to any comparison on this blog is reliability. For that, Samsung is an unknown. As a line, it is good, but Samsung sells refrigerators and laundry as a rule. Their dishwashers an unknown due to lack of sales. You pay a premium for the Miele reliability. It has been the most reliable product sold at Yale. That said, Samsung would be the choice for features and a lower price, but Miele is better for a proven, reliable product. Since both are not widely sold, find out who can fix either before buying one.